If Gilliam County loses much more population, its wide open spaces and collection of three tiny towns — with no stoplights and 1.6 square miles for every person — could soon become a veritable nowhere. Percentage-wise, it regularly tops the census list of Oregon counties that are losing population, a steady stream of about 80 or 100 people every year. And Gilliam County is far from the only place in the rural West that's in danger of becoming a ghost county. In places like Clearwater County, Idaho; Niobrara County, Wyo. ; and Treasure County, Mont., the loss of 100 or so people regularly translates to population declines of 5 or 7 percent, year after year. The drop is fueled primarily by two factors: old-timers who die, and young people who move away. "Our teens graduate and they leave, and why not?" said Jan Eason, an associate pastor at a Nazarene church in Gilliam County. "What is there to come back for?" In Niobrara County, Wyo., which has just 2,237 people left after a decline of 7.1 percent between 2000 and 2003, 18.7 percent of residents are over 65, compared with 11.7 percent statewide. And if the trends continue, in a decade or two, some such counties may be virtually empty. "People either move to Billings, or, if they get really old, they go into assisted living or they die," Treasure County Commissioner Mack Cole said after a round of census figures last year showed that population there had dipped to 735 people. "The future is about what is now." Some places, though, don't want to give up, including once-prosperous Gilliam County, whose farmers supplied wheat and grain to a battered world after World War II. As other nations rebuilt, demand slipped. By 1984, many local farmers felt they had no choice but to take the buyout money offered by that year's Farm Bill, aimed at curbing overproduction, and protecting eroded agricultural lands. By the early 1990s, the county's economic backbone was gone. County leaders were searching for any kind of moneymaker at all. All they really had to offer was plenty of vast, empty space. Fortunately, that was just what urban areas like Portland, 137 miles up Interstate 84, needed — a vast, empty space to put trash. 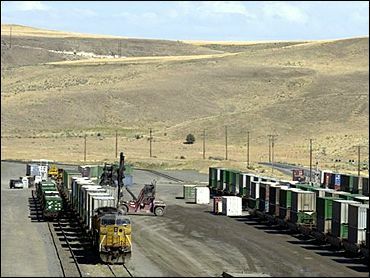 Gilliam County became the site of an environmentally sound rural landfill, a distinction which now brings in $1 million a year to the county's tax rolls, and is a linchpin of what remains of the economy. "At night, we sit in our porch swing, and count the garbage trucks that go by," said county resident Darlene Smythe, 70. Fueled by that success, the county placed an ad in The Los Angeles Times that touted the low cost of living, clean air, and nonexistent traffic in Condon. National media parachuted into the story, and the responses poured in; when the dust cleared, there were some new faces on the street. But they were mostly retirees, who didn't come with new jobs in tow. Next, the county helped bankroll a nonprofit assisted living center, a move, Gilliam County Judge Laura Pryor said, to "stabilize, so generations can stay together." But perhaps the crown jewel in the county's attempt to save itself from extinction is the Hotel Condon, the anchor of Condon's downtown, and once abandoned and empty, save for the occasional bat. A motley group of investors — the local newspaper editor, farmers, ranchers, the district attorney, the owner of a local chemical company — decided they couldn't bear to see the grand old dame of a building waste away. They all chipped in, as did the county, and little by little, the hotel was restored to its former glory, with period light fixtures and velvet drapes, as well as modern conveniences not often found in small town hostelries, like wireless Internet access. More development efforts are in the pipeline, like wind power projects on ranches and plans to make Gilliam County a wi-fi hot spot. The federal government contributed $920,000 for the development of a new "grain quality" lab, to do market research about which strain will ultimately be the best product. Residents say they'd just like to hold on to the grocery store and the drug store, perhaps even to grow the county back to all of 3,000 people. Even with the hotel, the trash, the grain lab and the nursing home, there are still those population numbers, slipping a bit more as each year goes by, and empty buildings on main streets. The newly gleaming hotel has sometimes struggled to attract guests, and plenty of high school graduates leave town without looking back. "We are afraid we haven't bottomed out yet," said McLaren Stinchfield, editor of the county's weekly newspaper, The Times-Journal. "We didn't seriously think about what we could do to help ourselves for a very long time. It looks bad, but it could get worse."